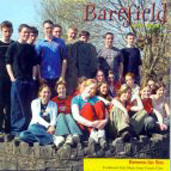 The Barefield Ceili Band is a twenty-piece band of excellent young musicians from an area just north of Ennis, Co. Clare, who have learned their craft under the guidance of local fiddle player Denis Liddy (his duet CD with flute player Michael Hynes is also well worth hearing), and have won several All-Ireland titles, the last one in 2002. They have now released their third CD, recorded last April--I had barely reviewed their second one, "Flowers of the Burren," in my last issue. On this new album, the twelve tracks are arranged for the two most popular sets danced in Co. Clare, the Caledonian Set and the Plain Set. The tunes, mostly dancing favorites, are played faultlessly and with great spirit. Lovely dance music.